A Bundaberg Rum ad before a ‘Dora the Explorer’ YouTube video. A Captain Morgan ‘Party like it’s payday’ ad outside a Centrelink office. Both are completely inappropriate, yet neither ad breaches any alcohol marketing regulations in Australia. Why? Because in Australia, like many other countries, regulation of alcohol marketing rests largely with the alcohol and advertising industries. There are numerous deficiencies in the current system and how it operates – for example, there is strong representation from industry, the system is voluntary, important forms of marketing are not covered, including sponsorship, and the regulation of placement is incomplete and inconsistent. The McCusker Centre for Action on Alcohol and Youth and Cancer Council WA had had enough with the self-regulatory system failing to protect children and young people – so in 2012, they took matters into their own hands. With support from health groups around Australia, they launched the Alcohol Advertising Review Board (AARB). The AARB accepts and reviews complaints from the Australian community about alcohol ads. We aim to highlight the volume of alcohol marketing and weaknesses of the self-regulatory system, and motivate governments to implement effective controls on alcohol marketing. The AARB has been running for over five years now, and in that time we’ve learnt some valuable lessons that can provide guidance to other countries wishing to use a similar approach to stimulate policy change. The foundation of an advertising review process is a code that improves on the weaknesses of self-regulatory codes, has the wellbeing of young people as its primary objective and is comprehensive in its coverage of alcohol marketing strategies. The AARB Code covers all forms of alcohol advertising and promotion, including its content and placement. The Content Code is constructed using only provisions from existing self-regulatory or quasi-regulatory alcohol advertising codes from around the world. As we were unable to find any existing codes which comprehensively cover the placement of alcohol advertising, for the placement code we identified provisions that we believe would reasonably reduce young people’s exposure to advertising. Maintaining a strong but fair position by providing advertisers with the opportunity to respond to complaints and administering review processes meticulously, as well as in a timely manner, gives credibility to the process. AARB procedures were developed to ensure the review process was responsive to complainants. Advertisers are invited to respond to complaints, which are then reviewed by three panel members. We have almost 150 volunteer panel members, drawn from a range of professions including public health, research, medicine, law, education and marketing. If they find an ad in breach of the Code, we notify the advertiser and request they remove or modify the ad. We have no legal backing to enforce our decisions – our power comes from exposing the inadequacies of the industry’s self-regulatory system and publicly naming and shaming alcohol companies that advertise irresponsibly. A well-planned approach to considering and managing legal risks will minimise the possibility of challenges from well-resourced vested interest groups. We found it valuable to involve appropriate legal expertise in the development and implementation of the AARB, as we quickly caught the industry’s attention. Within hours of the AARB launch in March 2012, at least six advertising and alcohol industry representative groups released media statements opposing its establishment – and there has been plenty more from the industry since then. Support from reputable and influential organisations maximises advocacy efforts. Supporting groups can help to build awareness and mobilise their networks to participate in advocacy activities, and many groups singing from the same song sheet adds strength to calls for action. The AARB would not have been a success without support from leading health, community and other organisations around Australia, and would be unable to operate without our panel members donating their time and effort. Finally, the sustainability of advocacy activities should be considered. It is possible to operate a complaint review process with a modest budget – costs include staffing, communications and producing reports and advocacy materials. It’s important to generate innovative ideas for advocacy activities and have regular contact with policy makers to encourage continued interest in the issue. The AARB uses strategies including community engagement, media advocacy and communicating with policy-makers to highlight the need for effective regulation. We generate media about specific ads that demonstrate the weaknesses of self-regulation, and use the release of AARB interim and annual reports for strategic media coverage and engagement with policy makers. For example, our latest report released in September 2017 calls on the Federal Government to end the relationship between alcohol marketing and sport. This report was communicated to relevant Federal ministers and major sporting codes that accept alcohol sponsorship. The AARB is evidence that an alternative complaint review system can have an impact. We have received more complaints and produced more determination reports than the industry’s self-regulatory system. Despite the major multinational alcohol companies declining to participate in the AARB process, a range of offending ads and campaigns have been removed or modified. And we’ve seen the industry scramble to ‘improve’ their regulatory system, likely in an attempt to avoid stronger regulation. But most importantly, we’ve seen governments respond. Following the release of our 2016 report calling for state and local governments to remove alcohol ads from public transport, the South Australian Government announced they would take this action. The Western Australian Government, elected earlier this year, has committed to removing alcohol advertising from all public buses, bus stops and train stations. Evidence and/or recommendations provided by the AARB were cited in both announcements. Moves to curb alcohol promotion will inevitably take time, and are fiercely resisted by a powerful global industry. The AARB is an innovative approach that has had noticeable impacts, and you can read more about the development, implementation and our lessons learned in Public Health Research and Practice here. Visit the AARB website to access reports and follow @AlcoholAdReview on Twitter to stay up to date on activities. And remember, you can be a catalyst for change! 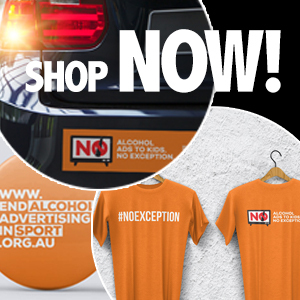 Submit a complaint about a concerning alcohol ad to www.alcoholadreview.com.au, and call for an end to alcohol sponsorship in sport by signing up to become a Booze Free Sport.